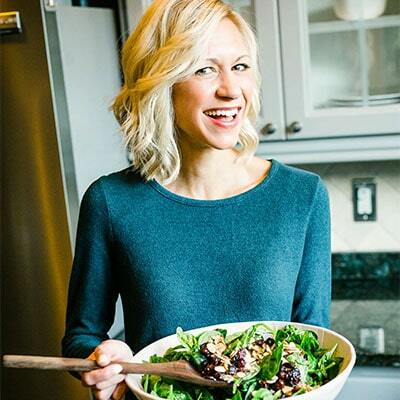 I love using seasonal fruit and veggies to make recipes. It doesn’t matter if it’s a spring rhubarb chicken dinner or a summer peach pudding dessert. My point is, when you use seasonal produce, everything you make with it tastes SO much better! 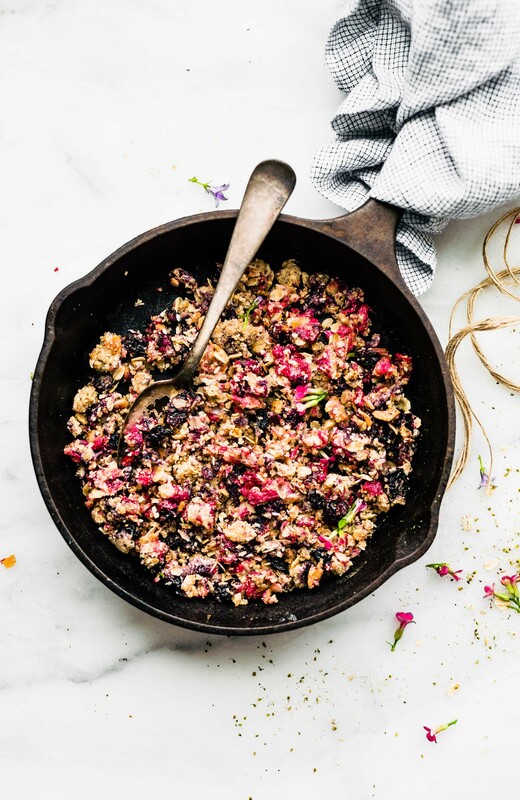 Especially in fruit desserts like this vegan fruit crumble recipe. Seasonal produce is also better for you because they retain more nutrients, which makes this dessert better for you too, right? Haha, kidding. Kinda. But that is one health perk, along with no gluten or dairy. With no butter and gluten-free oat flour, it’s obviously a vegan and gluten-free dessert. But the best part is, you don’t need to choose just ONE fruit to use! Instead, make a mix and match topping bar. As a result, everyone can top their dessert using their favorite fruit! But wait a minute; there are oats and no butter in this easy vegan dessert. So, is it really a vegan fruit crumble recipe, or is it a fruit crisp recipe? What’s the difference between the two anyway? I know, I asked myself that very same question! 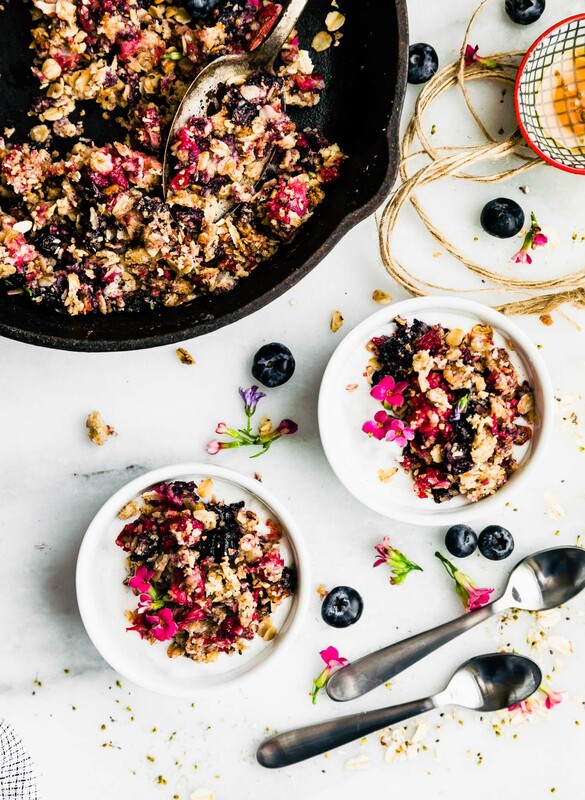 What’s the difference between a vegan fruit crumble and fruit crisp recipe? When it comes to making baked fruit desserts, there are actually several different options. Crumbles, crisps, cobbler, pie, betties. There are similarities and differences in all of them. For now, let’s focus on crisps and crumbles. A crisp is a baked fruit dessert with a light streusel topping; typically, but not always made using oats. When it’s baked, the topping becomes crispy and delicious. Hence, the name CRISP. 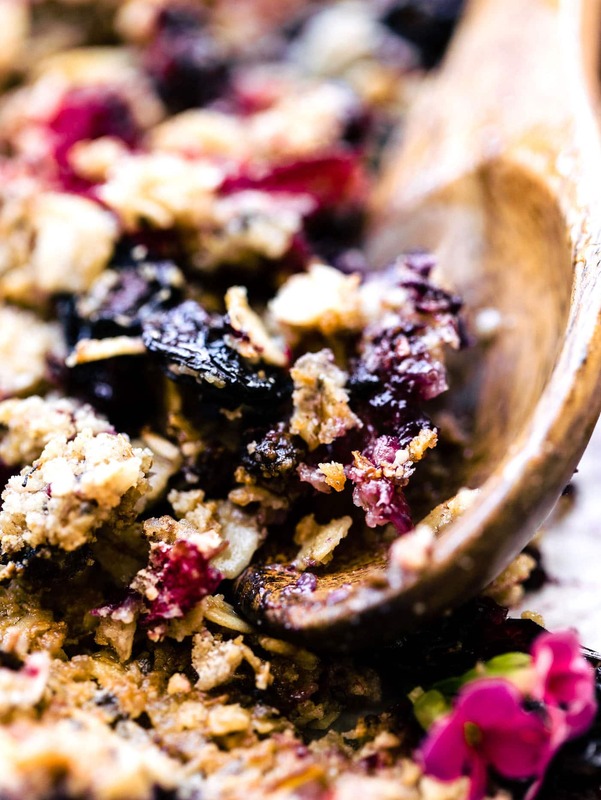 Like a crisp, fruit crumble is also baked. The difference is in the crumble’s topping mixture – it’s a bit heavier and denser than the topping of a crisp. So, it crumbles easily. Makes sense, right? Here’s where the confusion starts. 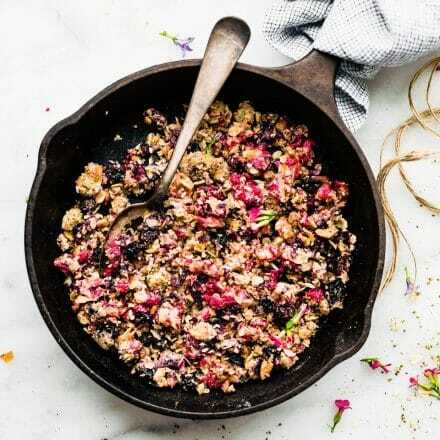 The heaviness of a crumble topping comes from butter and flour, which aren’t in this vegan fruit crumble recipe. To confuse matters further, our topping is both crisp AND crumbly! So, I guess the moral of the story is, call this healthy dessert a vegan fruit crumble if you want to, or don’t. It’s a fruit crisp recipe, too! 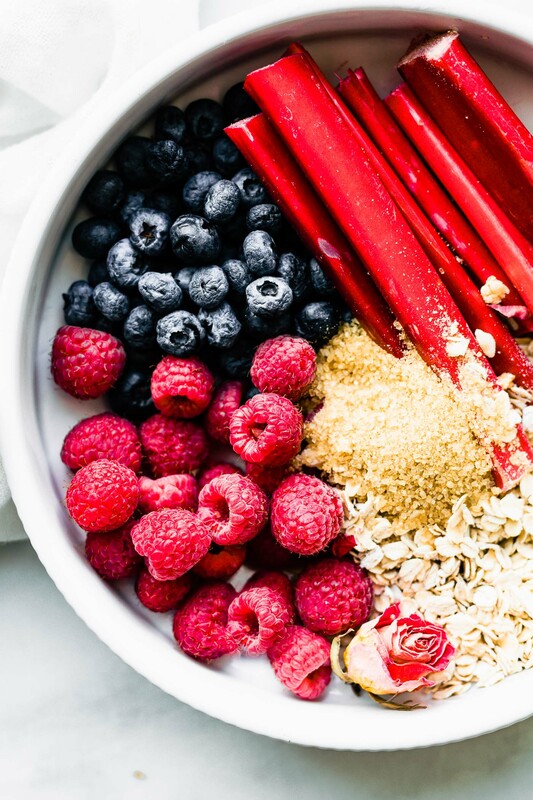 Ingredients you need to make a vegan fruit crumble! Instead of making the dessert in individual ramekins or a casserole dish, we bake it all together in one pan/skillet. 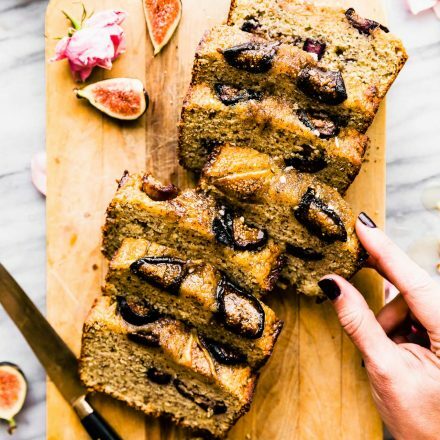 Just pick a favorite fruit (or two) and mix with the other ingredients; oat flour, oats, sliced vegan butter or coconut oil, cinnamon, and sugar, in a bowl (or multiple bowls for different fruit combos), then layout it all out on a baking sheet or oven safe skillet and bake. Below we have a coconut blueberry and a rhubarb and raspberry! But you can choose whatever fruit you’d like. Then combine with the remaining ingredients; Make sense? After baking, scoop out individual servings and we combine it with coconut yogurt. A lighter, refined sugar-free seasonal dessert for spring or summer! Oh, and here’s an optional serving suggestion. You can just use the vegan fruit crumble as a topping for coconut flour pancakes, vegan ice cream, waffles, etc. 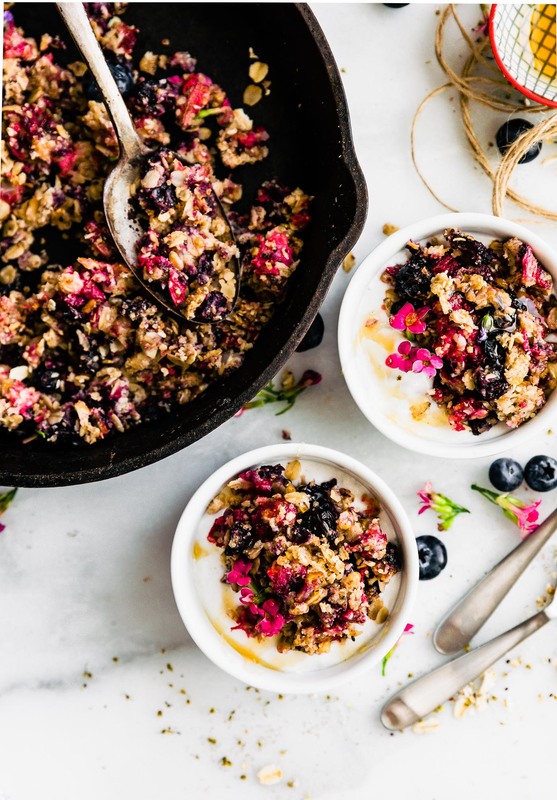 Whether you want to call it a vegan fruit crumble recipe or a fruit crisp doesn’t really matter. The important thing is, it’s super easy to make and it’s DELICIOUS! Preheat oven to 350 F. Line a baking sheet or oil an oven safe skillet. Set aside. Spread the mixture out evenly in the skillet or baking sheet pan. Remove and serve immediately on top of non dairy yogurt, ice cream, or dessert of choice. 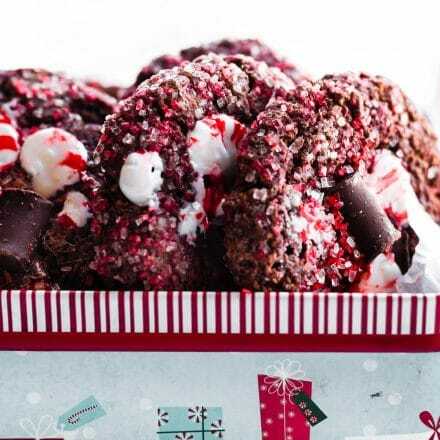 Make ahead tip – Make and keep for later. Once cooled, store in airtight container in fridge for up to 5 days or freezer for 3 months. Simply warm in oven before serving. If you don’t have oat flour, feel free to use all purpose gluten free flour. Okay my friends, tell me this. If you had to choose 2 fruit to mix and match, which 2 would it be? 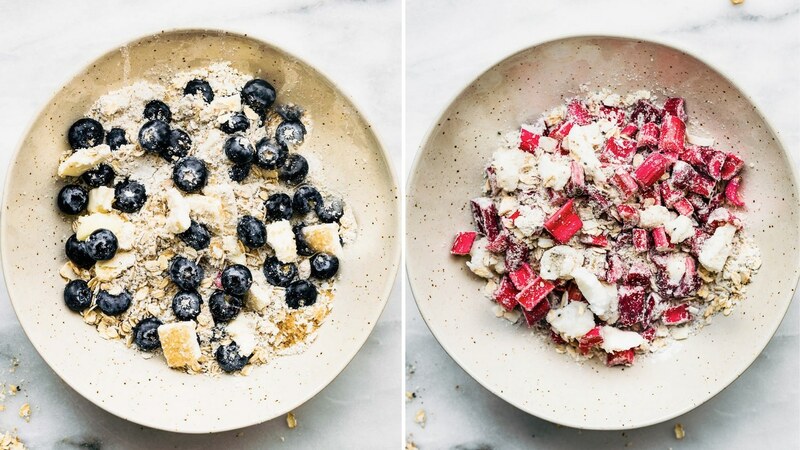 Rhubarb and berries are hands down a must try. I may be bias! Do you have life updates? What’s new with you? I want to be able to support each and every one of you all so please do share in comments. Mmm k? Looks so dreamy!! Would be perfect over some yogurt or ice cream too 😉 Can’t wait to hear about those updates!! Oh absolutely 😋 so good over coconut ice cream! Looks amazing – perfect summer dessert! 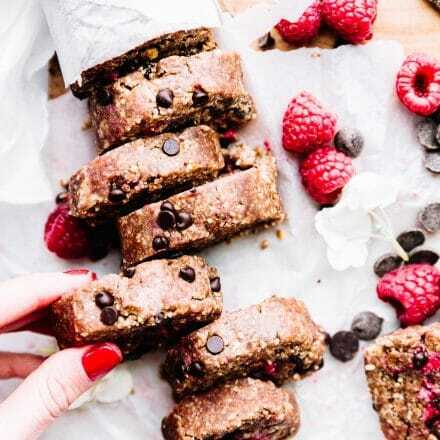 I would have to do raspberries and blueberries – so everyday, and yet still so delicious! 🙂 And yes to a behind the scenes post, for sure! I love that you threw rhubarb into the mix! 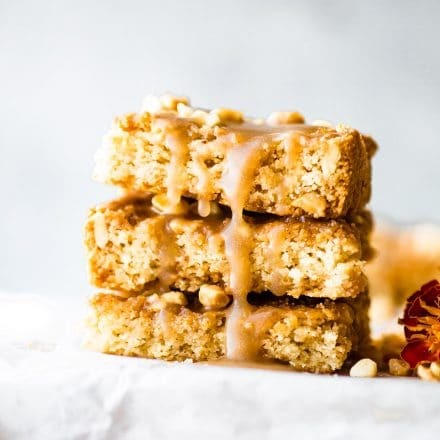 Perfect spring dessert no matter what you call it…and super tasty!! This will be great with ice cream or yogurt! Can’t wait to try it. This recipe is amazing! 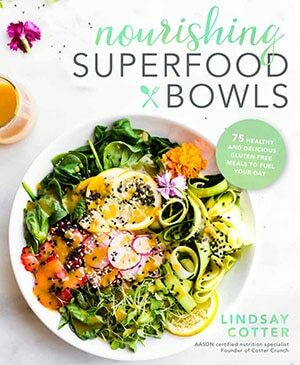 I’ve had something similar and it’s totally a favorite, but this one is my NEW favorite because it has so many healthy additions. I love the idea of serving it with Greek yogurt, and your addition of edible flowers put it in a category of its own as far as beauty! Oh you must share your recipe! 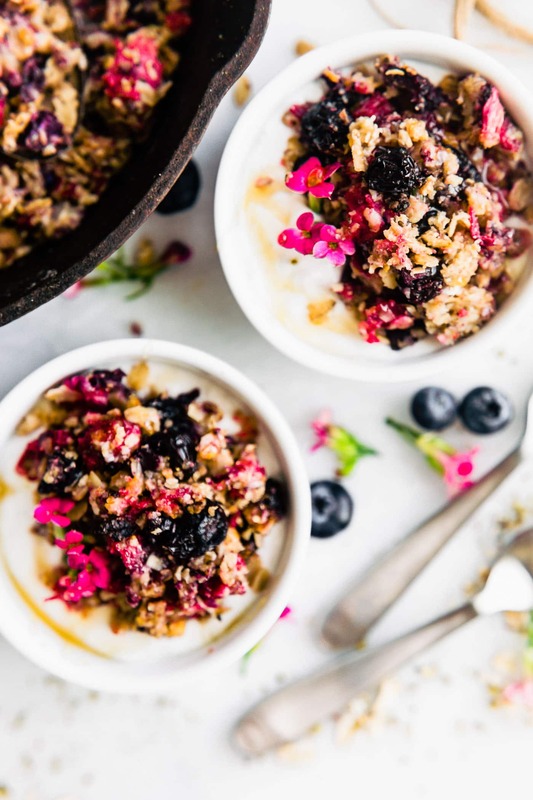 We made this for breakfast and really loved the mix of textures! Oh awesome! What did you end up putting it on? Love how easy this is to whip together! Delicious, gorgeous and healthy! A home run! I loved it! Packed full of delicious flavors! 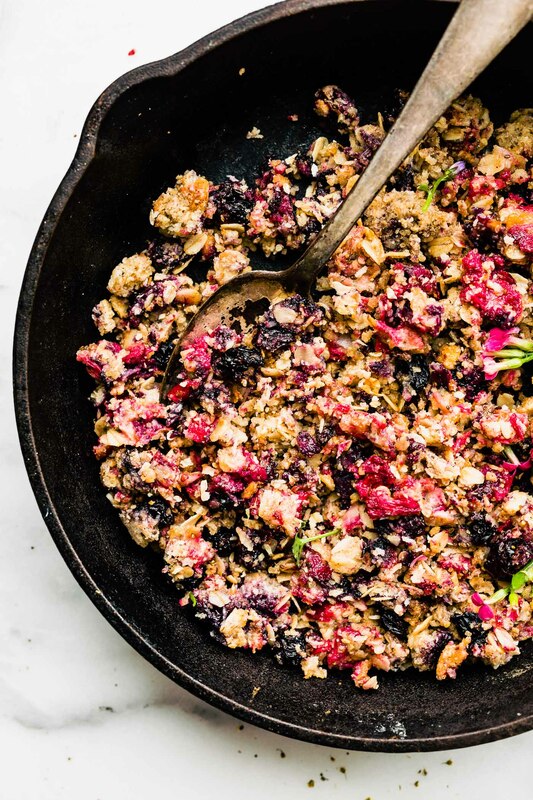 I am sucker for fruit crumbles and this recipe is my new favorite. So versatile and easy. Thanks for sharing.